before the Blessed Virgin and the whole company of heaven. The flame stood for my prayer which is always with me. In February and March I was in Kerala, Goa and Kashmir, where I gave lectures and workshops in memory of Bede Griffiths. I have shown over 500 photos of Fr. Bede - most of them not published so far. Enclosed please find one of my lectures, given in Goa. In Sanskrit and in our scriptures OM is the only word which is specifically mentioned as denoting God. Perhaps some of you who study Hindu philosophy know that we have a million names of God – Narayana, Vishnu, Rama, Krishna, etc. For that we have been criticised by everybody, but I can tell you that OM is the only word that has been given as indicative of God and the others are only descriptive words. For instance, “Vasudeva” means, “That power or that God which pervades the whole universe”. In Sanskrit each word has got a meaning. “Rama” is “That aspect of God in which we rest and enjoy”. “Krishna” is “That aspect of God which attracts you” and which also “rubs and purifies you”. “Hari” is the Name referring to that aspect of God which “takes away all our sins, defects, weaknesses”. I have only given you a few. There are millions. Yet the Hindu will not agree that Vishnu and Krishna are just one and the same. God is one: but He has different aspects. It will not do to confuse them. Here is Mr. Alexander and his son Hariom. Suppose Alexander becomes a Judge and Hariom is an advocate. When this boy goes to the Tribunal where the father is the Judge, he cannot say, “Papa, my client is good”. Even though the judge is the father, the son has to address him, “My Lord.”The aspect is different. When he comes home, the son will not say, “My Lord, let us go to the Ashram”. He will use the more familiar expression. In the tribunal you are looking at the man as the judge. Here the same man is the father. God is one. Each name refers to Him in different aspects and you use that aspect which you wish to invoke. You will find this again in Yoga. Though we have so many Mantras, we invariably use OM in conjunction with the other formulas. OM is the word by which we refer to God, and then, we also include some other aspect. You can use any formula, but combine with OM. FROM ROLAND R. ROPERS O.S.C. Michael A. Windey was a giant & silent spiritual master of the 20th century. He did not publish a single book but composed many poems in various languages. His unique personality needs to be always and repeatedly remembered. For me he was a “Mahajivanmukta” , a man who attained liberation during his life on earth. with Indian melodies and Mantras. Sr. Rose lives as a hermit in an ashram in Kerala, South India. She was inspired and initiated by Fr. Bede Griffiths in 1976. The chanting of the name of Jesus with Indian melodies at the morning and evening sandhyas at Santivanam impressed her deeply. 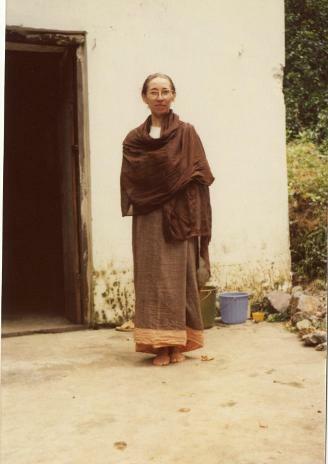 Later she took to the ashram way of life and pursued the study and practice of Jesus Prayer (Prayer of the Heart) intensely. In recent years she initiates spiritual seekers to this form of contemplative prayer in various parts of India, in some East Asian countries and in Europe as well. The spiritual heritage of Jesus Prayer started with the Desert Fathers in Egypt around the 4th cent. To remain and to live in the constant awareness of the presence of God, in the experience of his love and peace and also to face the struggles of the austere life in the desert, they found the devotional repetition of the name of Jesus very powerful and effective help. The spiritual masters affirm that in the invocation of the name of Jesus the attention is not directed to the historical person of Jesus, who lived 2000 years ago, but to the Christ of the present moment, the risen Christ, who lives in us here and now. The vocal repetition of the name is only a preparation for the awareness of the divine presence within. Concentration on the indwelling presence is the core of Jesus Prayer. The essence of Jesus Prayer is the awareness of the indwelling presence. Hence it is called the inner spiritual prayer. Mechanical repetition of the name without interior awareness is worthless, valueless. It is like trying to ignite the wood without fire. In order to remain in the awareness of the indwelling presence of Christ within, spiritual sobriety is fundamental to the practice of Jesus Prayer. Sobriety (nipsis) means watchfulness, attentiveness, vigilant guarding of the heart from anything that is not of God. Gregory of Sinai says “Let not the heart cling on to anything except God.” Watchfulness means to be present to the present moment. The Desert Fathers used the monologia form of Jesus Prayer. Only the name Jesus was being repeated. Later came up formulas like, Lord Jesus, have mercy on me, Lord Jesus Christ, Son of God, have mercy on me a sinner. The spiritual masters insist that our heart should resonate with the formula that we choose and the name Jesus should be included in it. The divine name evokes vibrations in the inner realm and leads to a deep oneness-experience. In the initial stage, when we choose a formula, we should not change it often. The invocation of the same formula for over a period of time will enable it to take root in the heart. And then it will become a stronghold in times of need or struggles, a constant companion. First Phase: In an atmosphere of peace and serenity one invokes the divine name concentrating on the inner presence of the Lord. With the rhythmic repetition of the divine name the mind becomes calm, still and serene. Then the negative elements of the psyche, of the sub-conscious level may surface giving the feelings of boredom, dryness and frustration, and the feeling that one is not gaining anything. We are led through a desert of inner dryness, which is a process of the purification of the psyche. We have to pass through this purification of the psyche holding on the divine name. Gradually the mind becomes serene and focused on the divine Master within. Second Phase: Jesus Prayer gets more interiorized. After the initial phase of constant repetition one spontaneously comes to a phase where the repetition stops. One feels that the name is being repeated from within. We listen to the divine name being repeated within. The name is being remembered. Distracting thoughts and images become less and they gradually disappear. Just the name of Jesus lingers on. Jesus Prayer ceases to be the result of one´s own efforts and becomes the self-acting prayer: the prayer of Christ in me. It gets rooted in the heart. One experiences stillness, peace and joy. This is also called prayer of loving attention, or prayer of simple gaze, where the soul rests in God. Third Phase: The divine name penetrates the deeper recess of the heart. The mind sinks into deep divine silence. Only a sense of the divine presence is experienced. The soul becomes silent, serene and receptive. The Holy Spirit takes possession of the human soul. My soul and the divine Spirit merge into one. This is the deep experience of mystical union. The human soul is being charged with divine energies. This is the experience of Hesychia. One finds oneself within the Cave of the Heart, the innermost sanctuary, the inner shrine, the interior castle, the inner room where the Divine dwells. This is Hesychia. This is an intense experience of divine grace. All that we can do is to open ourselves to the divine presence through Jesus Prayer. Genuine God-experience is ultimately a gift of grace. 1.Experience of Christ in us. In the practice of Jesus Prayer attention is directed to the presence of Jesus Christ within me in the present moment. Christ within me is experienced as the Ground of my being, the Source of my being, the source of my strength, inner light and convictions. 2.Christ Consciousness: The basic fruit of Jesus Prayer is participation in the mystical self-consciousness, divine consciousness, of Jesus. Jesus experienced the Father as the source of his being, the subject of his being and mission. Jesus was the manifestation of the Divine. Through Jesus Prayer we come to the experience that our life flows from Christ who dwells within. Our life becomes a manifestation of Christ in us, the subject, the true self of our being. Our life unfolds from the divine impulse, inspiration, illumination that we receive from Christ within. The compassion and love of Christ is expressed through our life, through our words and deeds. 3. A deep Trust in God: Life unfolds from Christ within. This gives a tremendous trust and joy in life, and freedom from fear. 4. Experience of the Indwelling Spirit: The Spirit of Christ transforms our life into divine life. Just as the vital sap of the tree flows constantly into the branches the divine Spirit streams into our being through the Prayer of the Name of Jesus. We listen to the divine Spirit repeating the name from within our heart. The Sprit prays from our hearts in a way that cannot be expressed in words. (Rom 8, 26) The God to whom we pray is the God who prays from within us. 5.Alertness to the Kingdom of God: Kingdom of God means God is at work in this world transforming everything to a new creation. Through Jesus Prayer we become alert to the grace and demands of God´s Kingdom. Our life is then shaped by the values of the Kingdom of God like love and compassion, freedom and justice, concern for the poor and for the environment. We become increasingly liberated from ego-centeredness and we grow into the process of God´s Kingdom. 6. Living in the Present: While practicing Jesus Prayer through sobriety, the guarding of the heart, we are consciously present to the present moment. Waking to the divine depth of the present moment is a grace. 7. Freedom from Loneliness: Jesus Prayer gives us an abiding sense of the indwelling presence of Christ. This is participation in the consciousness of Christ: I am not alone, the Father is with me. Through the invocation of the name of Jesus we grow into the awareness that we are not alone, but we are always guided by the Spirit of Christ, we are loved by the divine Father. 8. Awakening to the Presence of Christ in the Universe: In Jesus Prayer we wake to the presence of Christ in the cave of our heart. We realize that the same presence of Christ is shining through all beings in creation. Creatures are then seen as manifestations of the Creator (Theophany). This is the experience of the presence of Christ filling the entire universe (Christophany). In the presence of the indwelling Christ we look at humans and things of nature in a new way. The universe becomes the sacrament of God´s presence. 9. Respect for other Religions: The Spirit of God works in the hearts of others in diverse ways. Hence the followers of other religions come to God-realisation through their own symbols and names of the Divine. The practice of Jesus Prayer opens our mind to the diverse ways of the divine Spirit in other religions. Hence we grow to respect and acknowledge the authentic experiences of God in the life of believers of other religions. 10. Seeing Christ in the suffering Humans: Through Jesus Prayer we are sensitivised to perceive Christ in the poor and the sick, in the suffering and the marginalized people. We become more compassionate; compassion is the fruit of contemplation. 11. A deeper Insight into the Holy Scripture: Through the practice of Jesus Prayer, the faculty of insight is attuned to the divine wisdom. With this we are enabled to reread and interpret the Holy Scripture with an intuitive eye, enlightened by the Spirit. Thus we discover the deeper levels of the Word of God vibrating in the words of the Scripture. 12. Inner Purification: When we call on the name of Jesus with a humble and contrite heart a purification takes place in us. As a magnet brings iron particles into a definite order Jesus Prayer harmonized the diverse elements of the mind and psyche and purifies them. Jesus Prayer enables us to understand our selves deeper and to get rid of the negative elements by the power of the divine name. 13. Control of the Mind: Jesus Prayer makes the wandering mind anchored within the divine presence. Distracting thoughts and disturbing feelings are brought under control. One experiences genuine happiness and peace within. Heart gets filled with divine love. brochure of courses by Sr. Rose on Jesus Prayer in Germany in February, 2015. (see under subheading WELCOME AND NOTICES. Poet, essayist, farmer, and novelist Wendell Berry was born on August 5, 1934, in Newcastle, Kentucky. He attended the University of Kentucky at Lexington where he received a B.A. in English in 1956 and an M.A. in 1957. Berry is the author of more than thirty books of poetry, essays, and novels. He has taught at New York University and at the University of Kentucky. Among his honors and awards are fellowships from the Guggenheim and Rockefeller Foundations, a Lannan Foundation Award, and a grant from the National Endowment for the Arts. He married Tanya Amyx in 1957; they have two children. Wendell Berry lives on a farm in Port Royal, Kentucky. From http://www.poets.org/poet.php/prmPID/675. .....Dom Jacques Winandy, a Benedictine monk from Belgium, who spent seven years on Vancouver Island in the 1960s founding a remote hermitage, died recently at his home abbey in Clervaux, Luxembourg. He was 96 years old. .....A close friend of Trappist monk Thomas Merton of Kentucky, who also sought more solitude within the monastic life, Dom Winandy was an internationally acclaimed Scripture scholar. In 1964, already well-known in Europe as the elected abbot of his community, Dom Winandy came to the small town of Headquarters, Vancouver Island, at the invitation of the Bishop of Victoria, Remi de Roo. Dora Winandy sought to establish a tiny hermitage on the banks of the Tsolum River, a few miles west of Merville. The colony of eight hermits, which he led, was mostly unknown to local residents and even to the Catholic Church in general. But it became well-known to the worldwide monastic community, offering a way of life known in the early church that had all but disappeared in the last 500 years. .....At Vatican II (1962-65), monks worldwide were discovering their historical roots, studying the life of St. Anthony (AD 250-350) in the deserts of the Middle East. Many 20th-century monks felt a call to return to this third century AD eremitic life with its simplicity and monastic integrity, and to enter into pure and constant prayer. Dom Winandy provided the opportunity for aspiring monks to live the hermit life. 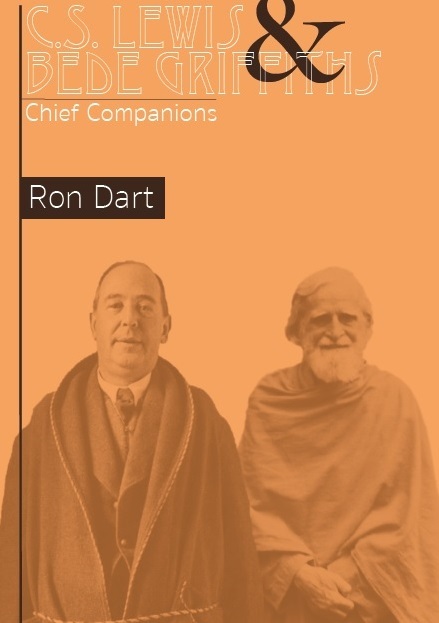 Merton said in 1968: "When you undertook this project of offering to people a hermit group with a minimum of structure, it was even before the council, even before Bishop de Roo made an intervention in the council, speaking of the need to recognize the hermit life in the church and to permit some monks to fulfill solitary vocations. Your work was epoch-making and it had a decisive effect on the rest of us." .....The desire for solitude came early to Dom Winandy. When elected Abbot of Clervaux Abbey in 1946, he had applied for admission to the Carthusians, a religious order with a strong eremitical bent. He abandoned the idea of a Carthusian vocation and then took it up again in 1962. As a youth, Dora Winandy had entered the Benedictine Abbey of Clervaux. He was a brilliant student, earning two degrees from San Anselmo in Rome. As the Second World War broke out, Dom Winandy was master of novices and professor of philosophy at Clervaux. Expelled from their abbey by the Nazis, the monks spent the war years in exile in religious houses in Belgium. Immediately after the war, Dom Winandy was elected abbot. Somewhat reluctantly, he accepted the office and presided over the reconstruction of the abbey, which had been desecrated by the Nazis. ......Before long, the word got out about the hermits on Martinique. Many monks came to see for themselves: Fr. Sylvanus de Aguiar and Gerald Groves, Fr. Hughes Vandoorne, Fr. Dunstan Morrissey. In 1963, more candidates sought acceptance. Some of the hermits were asking themselves if it would be to their advantage to become a group to safeguard the purity of the solitary ideal and to remain subjects to an elder as monastic tradition required. .....Dom Winandy's superior general and the Bishop of Martinique advised the monks to go to North America to start a colony of hermits. Authorization was given to Dora Winandy by the Sacred Congregation of Religious to make the move. The Diocese of San Angelo, Tex. was chosen and the hermits arrived in January, 1964. But the property that would offer them the needed solitude was too expensive and they turned to British Columbia instead. Encouraged by Bishop de Roo, they found a property at Headquarters, near Merville, B.C. There were eight and then 13 hermits. Each man had to build his own hermitage and provide a living for himself. This was quite different from the usual monastic house where one receives what is necessary and offers what he is able. In 1968, the colony became even more democratic, making the life of each hermit more flexible. .....Throughout the diocese, each hermit lived on his own, in real and complete solitude. They were not attempting to re-establish a unique and timeless norm or to recover the security of a glorious past; they were attempting to enter fully into that diaspora (spreading out) of which Karl Rahner, SJ, spoke so eloquently. The church will depend more and more, he said, on the goodwill of its ordinary members. It should be a qualitative approach, not a quantitative one; not drawing strength from a massive ecclesiastical entity organized on quasi-military lines, but on the openness, the freedom and the total sincerity with which the ordinary Christian is prepared to meet the non-Christian. The earliest monks in Catholicism, Rahner had pointed out, were simply laymen living in solitude or in small informal communities of a somewhat charismatic nature, grouped around a holy hermit - a spiritual father. .....A few months before his death, Merton wrote to Dom Winandy: "I would say frankly that for some of us, as individuals, for you as well, as for myself, there is a better way which is to be a hermit without disciples, simply on one's own and without any concern to promote the eremitical life for others. At most, two or three like-minded individuals could choose to live in proximity to one another, but without any engagement of any kind. This would provide the maximum flexibility." .....In time, several of the hermits found a solitary dwelling in the Canadian diocese: Fr. Donal in Nanaimo, Fr. Aguiar on Hornby Island, Fr. Charles Brandt on the Oyster River and Dora Winandy on Mayne Island. He wrote the important article, "Priest and Hermit," published in Monastic Studies. Then, after much prayer and counsel, he decided to return to his native country, Belgium. "It remains true that I have found here, on Mayne Island, everything I could wish as solitude and silence. But I had eventually to admit that this ideal is too high for me. I feel the need for more human contacts and for the possibility of more intellectual activity, as well. I have decided to leave for Europe and to settle in an old, 17th-century hermitage which I have known for years." .....Dom Winandy ultimately settled in the Ermitage de Bernister, Malmedy, Belgium (not far from Clervaux Abbey), where he remained for over 25 years, praying and studying, giving advice and counsel on request. His friend, Fr. Lionel Pare, came to the Hermitage of Bernister and remained in constant communication. At the end, Dom Winandy accepted his abbot's invitation to return to Clervaux. .....While the monks chanted the office of Lauds on the morning of May 11, Dom Winandy peacefully passed to the Lord, a true monk of the diaspora. .....As Merton had remarked: "The diaspora imagined by Father Rahner may well call for the small, poor, isolated and unknown monastery instead of the illustrious plants of our great American communities. The monk will have an important place in that diaspora, not as a pious organization man, but as a true servant of God." COPYRIGHT 2003 Catholic New Times, Inc.
most inspiring story, which she was happy for me to share with others. similar experience from one woman who was overwhelmed by a vision of Fr Bede’s hands totally illuminated in a golden glow, at a very desperate moment in her life). “I had this strong feeling to go to Shantivanam. I arrived in New Delhi and just had enough money to catch a train to Chennai, and then another train to Trichy. I arrived in Shantivanam in May 1994, more than two years after having left Austria. I felt the Spirit at Shantivanam, a strong feeling deep inside. I felt love through Shantivanam and through India. I would like to share with you a newsletter produced by Aranya Kutir, which I find very inspiring.I would also like to thank Ma Atmajyoti-Ananda for permission to publish it on our website. The occasional circular of Aranya Kutir, #10 (June, 2013). Char Dham Yatra: Here in the north, we are now in the midst of the “char dham yatra” season, which is the pilgrimage (yatra) to the four great (char dham) sources of the Ganges River: Yamnotri, Gangotri, Kedranath and Badrinath. For six months from May to October, the snows have melted and the four temples are open. However, in July, August and sometimes September, there are often landslides, flooding and rock-falls from the monsoon rains, which close the roads. The pilgrimage routes officially begin in Rishikesh. Thousands of devotees pass through Rishikesh on their way to the Source. All sites are 250 to 300km north-west to north-east of Rishikesh; each being about a 12 hour journey away by road. For two sites, some walking (about 14km) is required for the last stretch. Near the site of Badrinath, there is also the Sikh pilgrimage site of Hemkund which one reaches by an overnight trek through the Valley of the Flowers. These are all exquisitely beautiful sacred sites. You may read of Swami Abhishiktananda’s experience in his book Mountain of the Lord. Aranya Kutir Web-site additions: Two PDF documents have been posted onto the Hermits page of the Aranya Kutir website (www.aranyakutir.org): “An Introduction” to each of Jules Monchanin and Swami Abhishiktananda. The one on Monchanin is more a meditation on his first year in India (1939); the one on Swamiji includes: time-line of events in his life; a life-sketch; people and places in his life; and a list of the books he wrote (in English). The documents are about eight pages each and were prepared by Ma Atmajyoti-Ananda. Photos - Water: This time of the year, from about mid-May to mid-July, the village where the Kutir is located, Tapovan, experiences severe water shortages. The temperature in northern India is currently 40-48*C in many places. It’s over 40*C in Rishikesh. The added difficulty for this part of the village is that there is no road access to bring in a water truck. The problem is lack of inflow, but also lack of storage facilities in most houses. Lack of space, suitable building structures, and/ or finances, means many people do not have water tanks (some do not even have adequate buckets). The Kutir is currently providing up to 3000L per day to the neighbouring families. We receive the same inflow as everyone else, but we have over 7000L of storage. 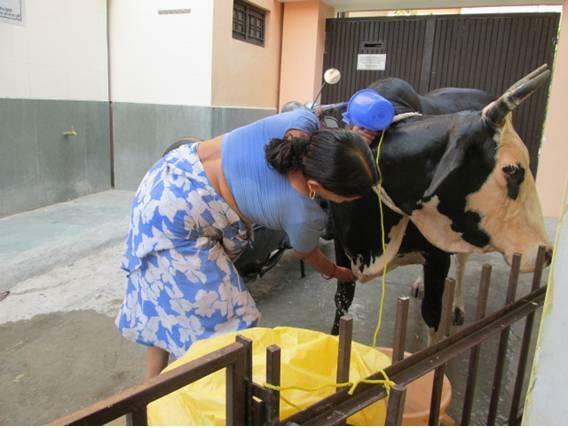 The photos show those accessing water from the Kutir, including the pregnant village cow who needed a cool-down, though she did not seem to appreciative it! “India is much more a spiritual dimension than a geographical continent” Swamiji Abhishiktananda wrote to Sr Térèse de Jésus (1965, Letters, p.168). Reflections: This issue profiles a remarkable woman - Sr Térèse de Jésus (pictured), who came from a Carmelite monastery in France to live in India (1965-1976? ), inspired by Swami Abhishiktananda. Sr Térèse is an intriguing and beautiful figure whose character and life is woven through the Letters of Swami Abhishiktananda from 1959 to his passing in 1973. 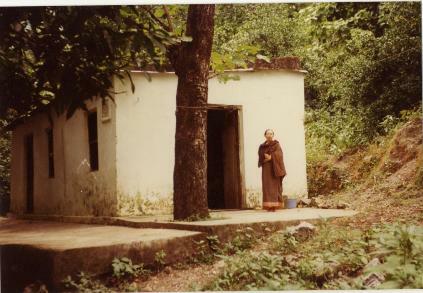 Amazingly, with the blessing of her monastery, she left her cloistered Carmel in France in 1965 to be a hermit in India, inspired by the life and message of Swamiji. Sadly, Sr Térèse disappeared sometime between 19 and 22 September 1976, from her hermitage by the Ganges. The place of Sr Térèse’s hermitage is only about 2 km upstream from Aranya Kutir, in an area called Brahmapuri. In mid-2010 I spoke to Pierre, a Frenchman who managed a leprosarium located just a short walk above the site of Sr Térèse’s hermitage. He told me that back in September 1976, he was going to Delhi for some days and he asked Sr Térèse if there was anything she needed. She requested some small item. On his return, he walked down to her hut to give her her parcel. He found her hut open and some vegetables that were being prepared for cooking on a table. The place looked disorganized, as though some monkeys may have been inside. His belief, and it seems the general conclusion, is that Sr Térèse went down to the nearby Ganga to fetch some water with a bucket. At that time of the year, Ganga is moving very wide and fast from the monsoon rains. It is believed the force of the water in the bucket, or a slip, caused her to fall into the river. Her body was never found. In Hindu belief, to be taken by Ganga is considered a very auspicious death. With the help of French friends, who took a letter of request from Aranya Kutir to her monastery in Lisieux recently, the Kutir now has these touching photos of Sr Térèse. She is dressed in a kavi-type cloth of sannyasa but in the brown colour of her Carmelite tradition. Later, the Kutir also received an obituary compiled by the Pondicherry Carmel, and which the archivist added to for our information. The photos will be displayed at the Kutir to remember her extraordinary life, courage and dedication to the search for Truth. As a means of following her story in India, the following biographical notes have been arranged as a source of inspiration for the readers of Beyond. All page references are to James Stuart’s detailed book: Swami Abhishiktananda – His Life told though his Letters. Prophetically, in early 1960, Swamiji wrote of the great interest at Lisieux: “Is the Lord preparing among them future hermits for Kedarnath and Hardwar?” Stuart comments: “Meanwhile the novice-mistress at Lisieux was bombarding him with searching questions, to which he felt he must give his best answer.” Sr Térèse felt such an eremitical call to India. To continue to support Sr Térèse in her initiation into India, in December 1967, “Sr Térèse arrived safely from the South, and after a week in the Sivananda Ashram accompanied Abhishiktananda to Jyotiniketan” (the small ashram of Murray Rodgers, a Protestant minister and friend) (p.196). It is worthwhile to read Swamiji’s words of advice to Sr Térèse at this time (see p.195), focused as they are on a life in the freedom of the Spirit: “In the life you have chosen you will constantly find yourself facing borderline situations which call for very great freedom of the Spirit”. These may well be Swamiji’s words to all his serious followers! In January to February 1970, Swamiji met Sr Térèse at Banaras (Varanasi). He wrote: “Her health is much improved and she views the future with great confidence” (p.224). “As in the previous year Sr Térèse spent the summer months of 1970 in the Kumaon Hills…” (p.230). Mid that year “Sister Térèse was facing a personal crisis, as it seemed that she might only be able to follow her vocation to solitude at the cost of leaving the Carmelite Order” (p.234). Swamiji’s counsel in reply, which draws on his own experience as a Benedictine, is of interest (see p.234). By the end of the year, Sr Térèse had returned to the Carmel at Pondi. Clearly these early years were unsettled and exploratory and marked with health issues. Aranya Kutir honours this extraordinary woman and her quest for God. Om Yeshu Naathaaya Namaha ! In memory of Anupama Mataji (Sr. Anne-Felice csst). Few people in the AA will know her. Anupama Mataji was 79 when she died on 1 Feb 2006. For two years she had been a cancer patient. From 2001 her base was Villa St Joseph, Bogadi, Mysore, the retirement home of her congregation. From there she went about giving yoga and spirituality classes, specially to the young sisters of her own congregation. Mataji retired as a professor after teaching 26 years at St. Teresa’s, Ernakulam, a college run by the Sisters of her congregation. She had to limit herself to teaching Logic as the college did not offer her subject, Indian Philosophy. However, her attraction for things Indian brought her in the late 1980s to the Himalayas, to Vandana Mataji and her Jeevandhara Ashram. Her plan to spend a year there had to be abandoned by an injury to her leg. About the year 2000 Anupama was working at the NBCLC and I was living alone at Maria Kripa. A 10-minute walk would bring her for a few hours or even overnight to a quiet and congenial atmosphere where we had a lot of exchanges. I marveled, as earlier in Rishikesh, at her humility in accepting suggestions and working through psychological hang-ups dating from her school days. Anupama showed me her mala. It had been worn smooth and soft by use over 5 or 6 years. Surely she would have continued with it for the remaining 5 or 6 years of her life. Latterly, I was looking for a Japa to give to a friend and this one seemed just right. Like Swamiji, I too tried it out. It was then I realised how beautiful it is. How perfect it is !!! I use it in many ways and explain some of them below. There is no need to keep rigidly to the directions. Each one can creatively adjust the Japa to her/his own physical rhythms. The Japa fits comfortably into one out-breath when said aloud. It can be given a simple but dignified tune with 8 beats as below. Or prayed/sung mentally over one complete breath. Prayed or sung mentally, first part (4 counts) goes with the in-breath and the second (8 counts) with the out-breath. If you wish to, the second part gives you time for a small bow of adoration. According to Hatha Yoga, prana rises from the navel to the throat with the in-breath: we allow the awareness of Jesus’ indwelling Presence to “arise” and fill our whole being. With the out-breath, apana moves downwards and we surrender, pour ourselves out at His lotus feet. This can be done for 2-3 minutes at the beginning. The Japa can be prayed mentally, chanted or sung with walking meditation. Just be careful to start with the right foot and make sure not to lose the 3 extra beats at the end. downwards. Naathaaya can be replaced by Christaaya. Om Sri Yesu Matre Namah ( I bow to the Lord Jesus Mother). Yeshu- Abba (Jesus-Pai) inspira Yeshu exala Abba. Om Yesu Nathaya Namah (or Christaya). Om Namo Bhagavate Yesu devaya (or Yesu Christaya) (I bow before You Jesus) or before You Jesus Christ. Yesu is the name of Jesus. In fact, it is much closer to the original name, since “Jesus” is a modern mispronunciation of an editorial decision made several centuries ago. Bhagavate is the Divine Lord, the Supreme Consciousness. Namaha means to prostrate oneself in reverence. Spiritually speaking, prostration is an external symbol of internal union. Om Sri Yesu Bhagavate Namaha therefore means: I bow to you, Yeshua, the Supreme Consciousness. As a spiritual discipline, chant this manifestation of the Divine Name (a practice known as japa in Sanskrit), while contemplating the meaning of the mantra. The vibration of the sounds are a concrete manifestation of the Divine Presence. Attentive meditation on the mantra and its inner meaning will dissolve all attachments to the transitory world, and open up in you the transcendent awareness of the indwelling Divinity. aqui neste video tem explicando sobre este mantra Om Sri Yesu Bhagavate Namah. I would like to share with you the transcript of a recording I made of Sister Stephany speaking to us at her ashram Jyothivanam in 1991. Sister Stephany is a disciple of Fr. Bede who gave her sannyasa diksha. We have to thirst and during that thirst we have to go and do some practises. We read books and learn and start to do some experimentations. Meditation is a means. It is like other means. To know what is within us - That Is - we can call That God or Truth or Brahman or some other name. It is a means to know That. To know means not only by the mind. To know means according to Vedanta ‑ to know means experience. Experience is not something from a book. It is not something from the words of saints or somebody else. Experience is something beyond words and scriptures. Scriptures we always respect and we keep and we preserve it as a holy revelation and it is very important for religion. But when the person wants to know That - the Truth – God - Brahman. ‑ it is by experience. After reading, after learning all these scriptures , after listening about all this, that person cannot be satisfied because it came from outside. Whether scripture or words from the mouth of a holy person, it came from outside. The person is satisfied, the person knows, the person can express what is known by experience only. After this experience there is no doubt. There is no longingness. There is no expectation to know that Ananda. ...The greatest moment comes in life when the person enters into the experience. The greatest experience. For the person who enters into that experience there is no doubt about God. There is no further question about That which is within. Nobody can change that person. Because everything comes from that known area. That person knows that there are no more questions to be asked. There are no more answers to be known. So for that this meditation helps. Step by step meditation helps a person enter into that experience. So meditation is to make a journey to become one with That. So it is a long process. It is not conditioned by age. A person may be 90 years old but still making that journey. All are moving towards that experience. God has given the intellect to use to be a help to move towards that goal that is God. It is easy to make that journey, whether he/she is a family person or dedicated to a religious communities. Who ever it may be, anybody can make this journey. We have to remember whatever situation we may be wherever we have to be. In whatever situation is provided we can make this journey and whether we know or we don’t know whether we accept or not, that journey is happening. The student gains higher marks when that person dedicates his mind to that subject. There are many subjects but that person dedicates more time to mathematics so he can gain more marks in mathematics. But less time for science so less marks. Like that we are all in the school of God making this journey towards the Goal. Nobody is exempt from this journey. So since we are all gifted to know about this journey we are making this journey with awareness. The Divine which is planted in the depth of our heart is the Goal. We need not worry about experience, but we have to cooperate. Just cooperate. We have to cooperate, whether we follow Raja yoga, karma yoga, mantra yoga or whatever yoga. We have to co‑operate.